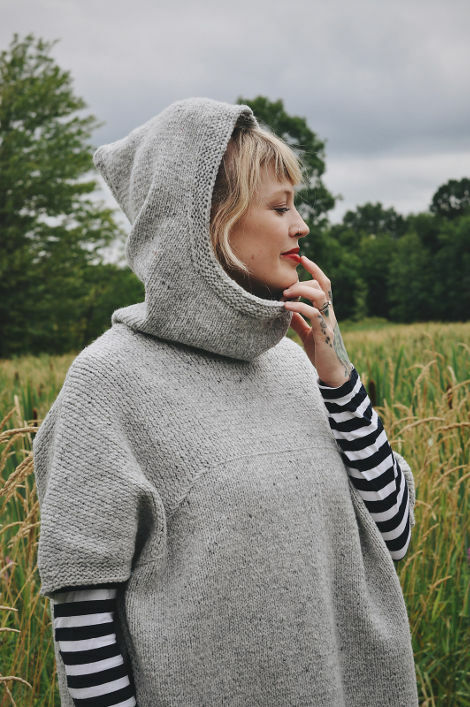 In Episode 33 of the Fruity Knitting Podcast we speak to Andrea Mowry, best known for her two most popular shawls, “Find your Fade” and “Briochealicious”. 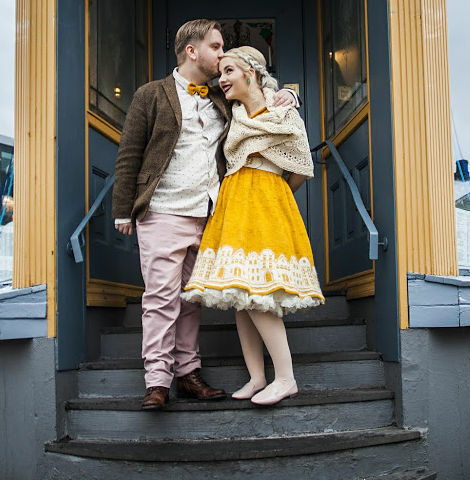 We’re then heading north, to Oslo, Norway, to meet Marthe, our guest on Knitters of the World, and then on to Reykjavik, Iceland, to meet Chantal Belisle, who will present her pattern House Dressing in New Releases. 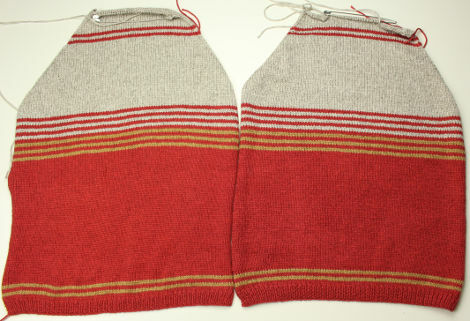 Madeleine has progress on her Sarah Hatton sweater, we have one Bousta Beanie, and there’s a tutorial on cutting and grafting. Enjoy! 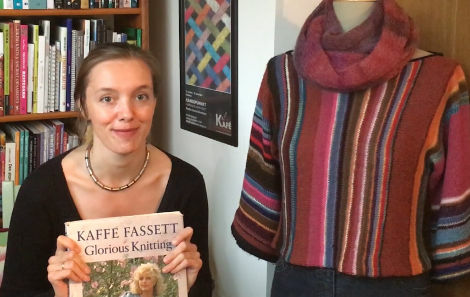 Although Andrea is a fairly new knitwear designer having published her first pattern in 2014, she already has a prolific output of designs. She has used shawls and ponchos as a canvas for exploring color, texture and techniques like brioche. 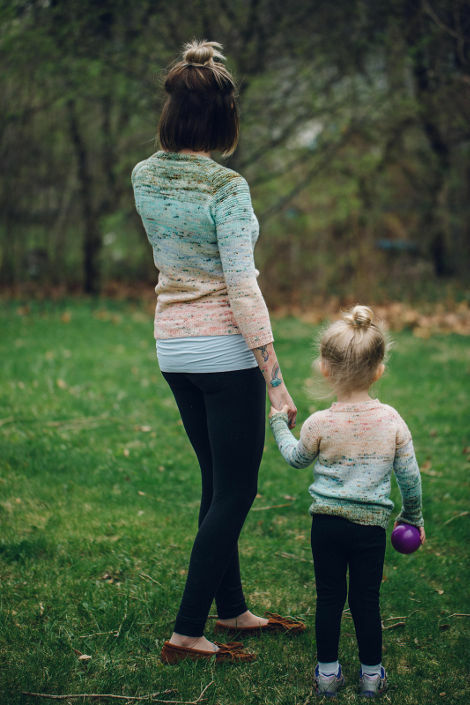 Andrea has been instrumental in empowering knitters to creatively play with color through her very famous Find Your Fade Shawl. Her very popular Briochealicious shawl has also made it easier for newbie knitters to try out the Brioche technique. Andrea does her work in the context of maintaining a healthy, sustainable lifestyle where the concept of handmade plays a key role. 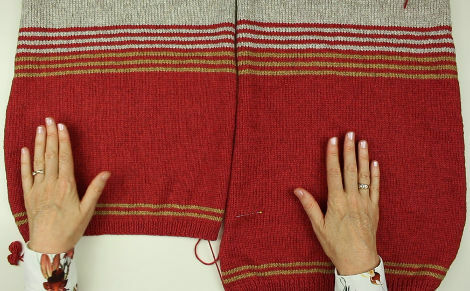 Rather than ripping back and re-knitting, Andrea agreed to cut, rip, and graft.You can see the tutorial of that in the show. It’s pretty much like kitchenering up the toe of a sock, except that instead of being tucked away in a shoe, this fix will be right across the front of the sweater. Use a new piece of yarn for the graft, so you can adjust at both ends. Give yourself plenty of yarn – Andrea suggested four times the width of your work. Do the graft loose initially, then adjust the tension afterwards. When adjusting the tension, start from the center and work out in both directions. Madeleine now only has the one sleeve to go and then she is up to sewing up the seams. I’ll be keeping an eye on the length. In our last Fruity Knitting Live event, Ann Budd told us she was an advocate of mattress stitch for seaming, but I am sure Andrea will be bringing Madeleine into the backstitch camp. Andrea is wearing the Pullover Number 27 from the Filati Magazine 35. The magazine is out of print, and I didn’t see the pattern online, so you’ll have to keep your eyes open for a copy. The wool is the Lana Grossa Cambio, 70% cotton and 30% microfiber, which also seems to be discontinued… I think the message here is, there are lots of new patterns and there are lots of new yarns. I really enjoyed knitting up the Bousta Beanie, created by Gudrun Johnston for the Shetland Wool Week 2017 – in her role as Patron this year. Although I made the beanie shorter, I do think the original design by Gudrun is really cool, and I would recommend that any non-bloke knitters stick to the original. Andrea says that she really ought to have a Bousta Beanie too, so we may see a complete sample on the show yet. The Shetland Wool Week has a tradition of having an official pattern created by the Patron for the year. 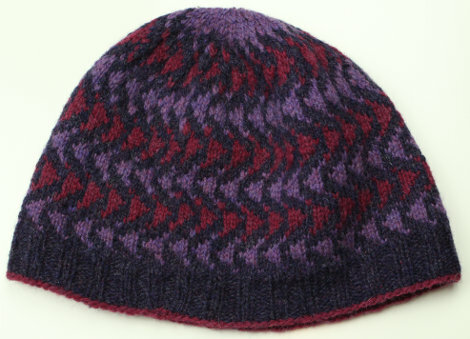 Donna Smith’s Baa-ble Hat was hugely successful, and I think this design by Gudrun Johnston should be just as popular. 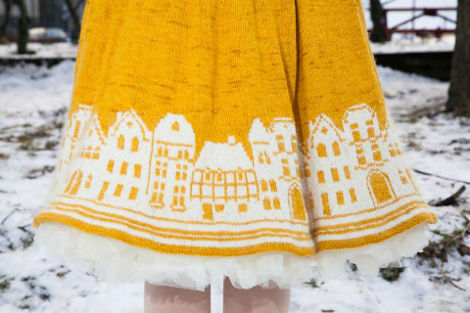 It looks great and if I can knit it, then anyone can. Pick a nice colorwork yarn. We had some Virtual Yarns Hebridean 2-Ply around, but the pattern recommends the Jamieson and Smith yarns. If you’re in the US, then you can buy Jamieson and Smith yarns from Claire at The Woolly Thistle, and save on shipping costs. There are some color recommendations with the pattern, but be creative and you shouldn’t go far wrong – one dark and two lighter, or two dark and one lighter. 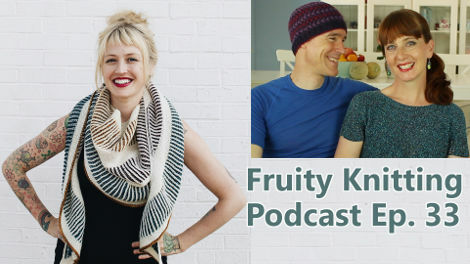 Put yours up on Instagram and include a #fruityknitting tag to let us know! This gorgeous little pencil skirt can be made knee length or as a mini skirt. Here is Madeleine modelling the mini skirt version. I made an unlined version because I didn’t have any stretchy lining to go with my stretchy skirt material. The project was an easy sew but making the button holes really tripped me up. I practiced many times but because the material has a strong stretch and the button holes lie horizontally, they always had a puckered look. I tried ironing on a non-stretch facing to help keep the fabric stiff and also sewing over a thin cord. The button hole looked neat until I cut it open and then it looked like a dogs breakfast. I was really scared of wrecking the whole project with ugly button holes so I decided to sew the buttons on the front for show and use press studs. I know it’s cheating but it works! So I will forever have the flight of the bumble bee (That is what it was?) in my head when I am ripping back. Great choice! Another great episode. I just watched your podcast and heard the beatiful music you used under your video of the paragliders. I don’t know why, but it brought tears to my eyes…..sometimes music does that. I looked for it on Spotify and now I can listen to it whenever I feel to it. Thank you for let me learn about this magnicificent Bach piece of music!!!!! I so enjoyed this episode. Give me more inspiration and I might burst! Really loved everything about this podcast episode. It was my first time watching…great variety and loved Andrea!